Provide a golden leads solution, capable of delivering qualified, complete and reliable leads for their call centre operations across the Asia Pacific region. 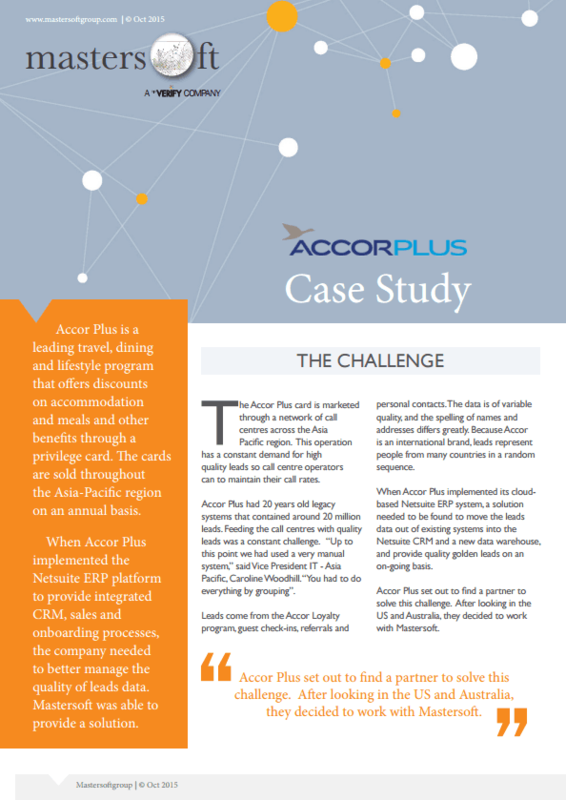 It was the perfect solution for Accor Plus. The solution standardises, verifies and matches records representing customers from all countries in a single process. A leading financial group replaced an aging customer platform that was falling behind new business needs. Mastersoft was engaged as part of a multi-discipline team to develop and test the solution architecture and to manage the data quality and migration aspects of the system. Harmony was implemented to provide ongoing data quality management functions in real-time. A government agency needed to allocate a unique ID to each citizen. It was essential that each citizen received a single ID. Harmony played the key role of reliably creating the unique citizen database. All duplicate records were successfully identified and no false matches were detected. Harmony Matching did not require tuning, allowing the project team to focus on higher order priorities such as the ID allocation process and distribution logistics. Australia’s leading insurers use Harmony to deliver accurate location addresses for real-time calculation of insurance premiums through portals, call-centres or intermediaries. The asset location is used to assess exposure to hazard risks such as flood, fire and storm. Harmony provides the correct address and spatial location at the point of entry. The entire process enables premiums to be provided to the customer in fractions of a second. Address entry is tailored to the desired customer experience to make it seamless and easy to use. As a result it is highly popular with front office staff, who enjoy the ease of use and can see the data quality benefits. The primary goal was to provide common customer data that allowed all front-end systems to instantly recognise a customer, view all associated business and be guided through cross-sell and up-sell opportunities. Harmony provided the ability to deliver different customer views based on context and privileges while ensuring that the Single Customer View solution was populated with accurate, high quality customer data at all times. A telecommunications group needed to centralise customer database support for management activities across the enterprise. Harmony was implemented to manage all aspects of the quality, consolidation and migration of customer data. Duplicate customer records were eliminated and all data quality targets were met. Harmony was then employed as the ongoing data quality platform ensuring that customer data continues to support business requirements. “Harmony allows us to eliminate multiple client identities where there should be one. Previously we would have customers duplicated within the system. “We have regained confidence in our database. The information is now higher quality, enabling a more accurate targeting of our marketing segments. 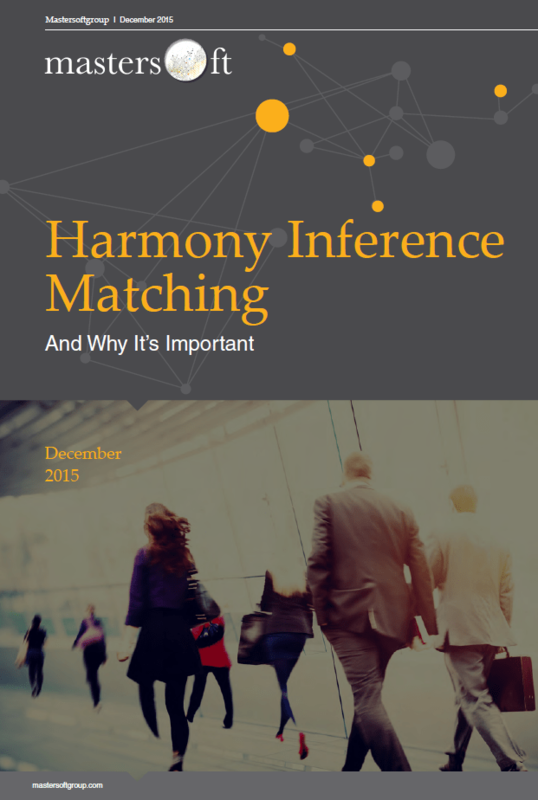 “Harmony is more than just top quality data base management and efficiency. 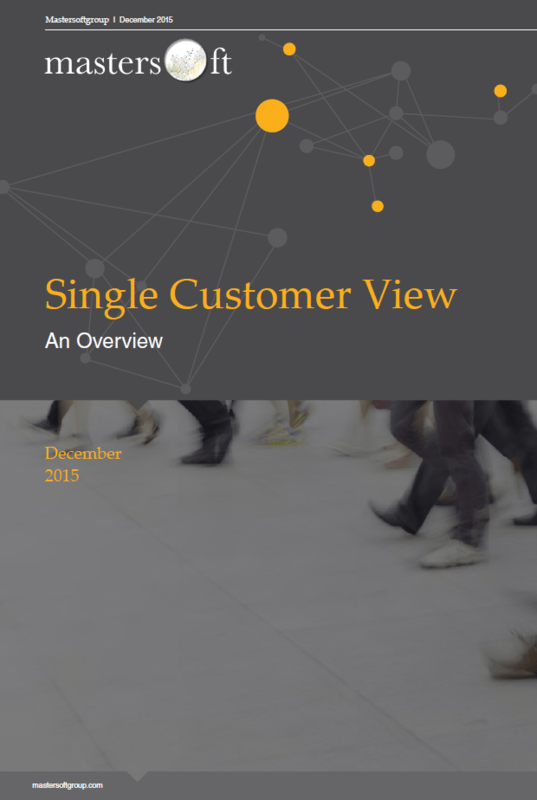 “In this day and age where customer service is paramount, we need to have a single customer view. When a customer contacts our service centre or needs to view their portfolio online, they can do so in one place. 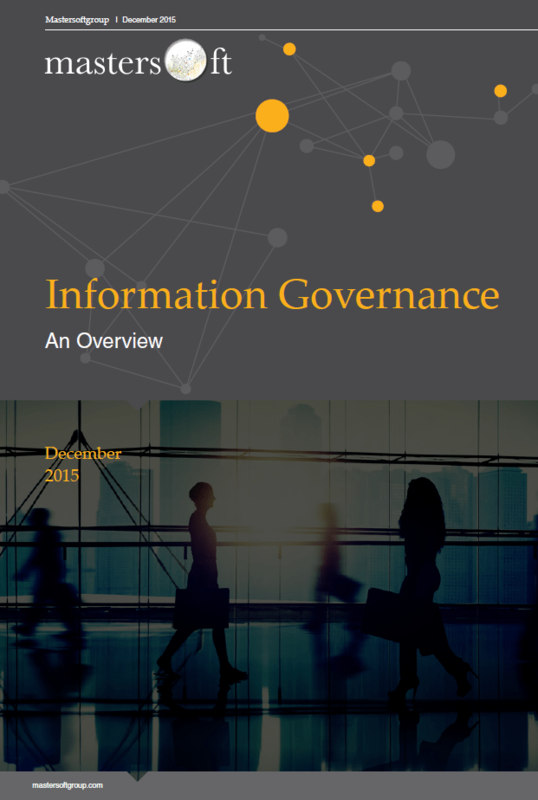 Ensuring accurate and consolidated client information is key to achieving this view. We have now been able to improve customer service levels significantly; that was one of the main drivers. Previously, we could have customers duplicated within our system. “Mastersoft have become a very important business partner for Allianz Australia with the Harmony Software suite now a critical component supporting a number of Allianz Insurance systems. Mastersoft have delivered a great customer service over the last 2 and half years and made critical contributions to the success of a major Allianz Insurance project dependent on capturing correct Australian addresses. Mastersoft were engaged through all lifecycles of the project and no request (of which there many urgent ones) was ever too much trouble for Mastersoft.